Getting frustrated with power outages in Michigan? A standby generator is a perfect way to protect yourself and your family during power outages and keep the lights on when everyone else is in the dark. Hartland Electric's electricians can install a generator so it is wired right into your homes electrical wiring. When the power goes out, yours can stay on. Lights work, water pumps, and freezers stay cold. Generators provide flexibility and comfort to weather the Michigan's storms. If you already own a generator and are looking for a safe way to power your house through it's current wiring in a power failure, we can install an electrical cut-off switch. This prevents any kind of back feeding of power into the electrical grid which can be extremely dangerous. Not only can we install your generator, we sell generators too! 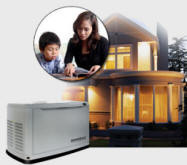 Request an estimate on entire generator installation packages. An installation of an automatic transfer switch can automatically start your generator and switch your home's power to standby generator power at the time of a power failure. You don't even need to be home for an automatic transfer switch to work.